OH MY GOSH! My month of Guest DT posts for Jaded Blossom is officially over after this post today :( I had SUCH a wonderful time with the girls here! They are SO talented, kind, caring, and FUN! I will certainly miss being a part of their team! I hope I made them proud this month, and I hope to be able to jump into a Guest DT post again soon! Hopefully REAL soon!!! 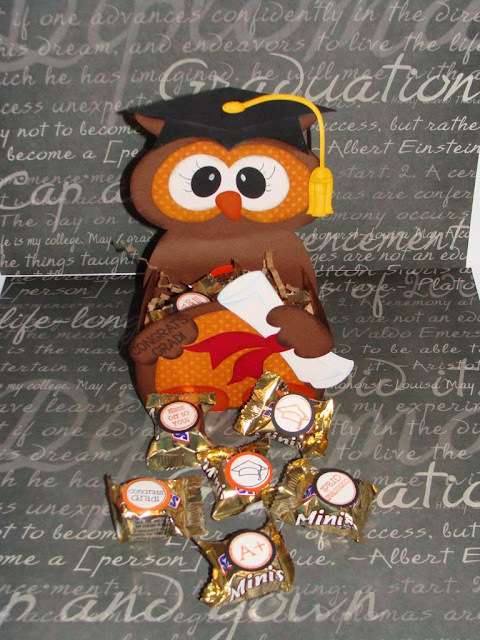 For today's post, I wanted to show you the project we made for the School Nurse of Brandon's school. Brandon has laryngomalacia and would end up needed a neb treatment at school, so he would spend a bit of time with Nurse Ann. This is something that happened from him being intubated at birth and he will have this until he is a teenager the doctor said. What it means is that his larynx will just collapse and he will have trouble breathing. He just needs a quick treatment and to catch his breath. It usually makes a "whooping cough sound" of cough which scares the people around him. A few of his teachers had told me that they thought he was choking! Nurse Ann would instruct the teachers about what happens to him during this time and she would make him feel right at home while he was having a treatment. This is a Thank You for her for taking EXCELLENT care of my kiddo when I could not be with him at school! Once again, these stamps make it SO personal!! Thank you SO MUCH for checking my blog out every day while I was guest designing! Thank you Candace and Michelle for allowing me this privilege to work with you and your DT! I had a great time and cannot WAIT to do it again!! Hope to catch you all Craftin' and Stampin'! Today is my 2nd to last guest design team post for Jaded Blossom and I wanted to show you another project I made to say THANK YOU to someone at my kiddos school! For today, we said THANK YOU to my kiddos lunch lady! Brandon is Autistic and has issues with texture and with eating. There is one thing, and one thing only that he loved to buy at school: Trix Yogurt. He LOVED when I would give him money in the morning to get it! Last year, he would get VERY upset because by the time he went down for lunch, there was not any left. It would ruin his whole day. Well, one day, at the end of last year, Mrs. Judi, asked him why he was so upset in the lunch room. Brandon told her because all he wanted with his lunch was his yogurt. She came up to me after school and asked me if that was "normal". I explained to her all about his texture issues and how he just wanted to "buy" lunch like the other kids (even though I did send him with soup every day). She said that every day, she would save him one, no matter what! I thought that was so kind of her to do! And since Brandon is leaving this school, I just wanted to make her something to show my appreciation for looking out for my little guy!!! Look how cute the lunch tray is! SO cute how these stamps REALLY add that personal touch! I hope this idea helps you to remember those that help you and your kiddos out during the school year! 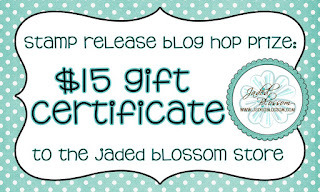 Be sure to come back tomorrow for my last guest DT post with Jaded Blossom! 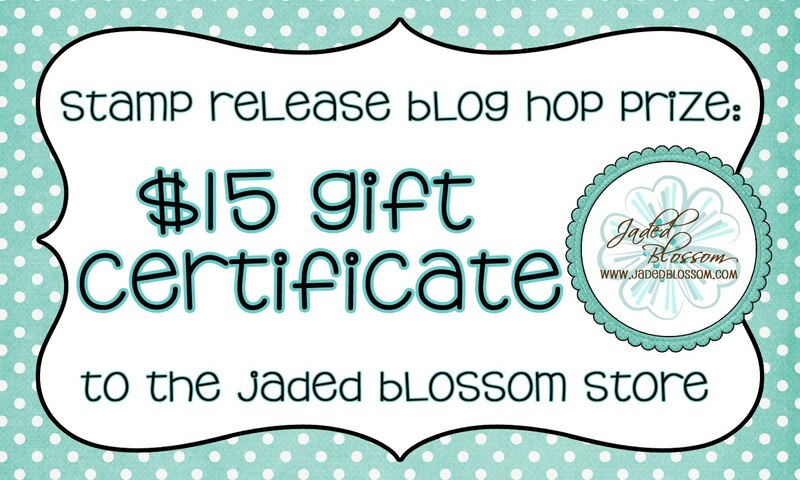 This is my last weekend as the guest DT over at Jaded Blossom! I AM SO BUMMED :( I had SUCH a great time posting my projects and creating new projects with all the girls on the DT over there! I feel as though I got to meet new friends, and I will learn a lot from them! I do still have tomorrow and Sunday to do posts! So be sure to check back those two days!!! For today's project, I was thinking of the people in Brandon's school who have helped him over the last 4 years. See, Brandon is leaving his "little" school now because it only went up until 2nd grade! He now moves on to the school right across the street from my house that goes from 3rd until 6th grade! So, I wanted to be SURE that I got all of the people in his school that have helped him a little something special that I made! Today's project was for Mr. Jim. He is the schools custodian. He was ALWAYS so helpful to Brandon! Whenever it rained, he would stand at the front of the school to be sure the kiddos made it up the steps safely. He would make sure that the gates were locked for them to play safe in the school yard at recess, and when Brandon lost his little figure at school the one day, he stayed late to help us find it! He is a really great man, so I made him this to say thank you!!! Cute little stamps on the bottom of the kisses-see the Custodian one?? I hope the projects I made for this weekend will give you some ideas for next year for the end of school to give to those that help your child that you may not remember right away when thinking of little thank you's to give!! So be sure to check me back out on Saturday and Sunday before I am done my guest DT spot with Jaded Blossom! 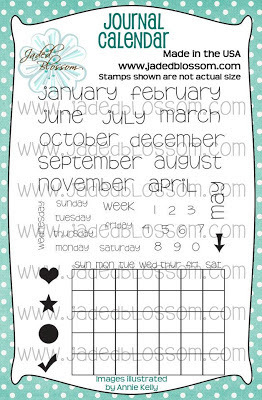 Hope to catch you Craftin' and Stampin'! Trixie here from Pink Glitter Studio. I have a cute little treat to share with you today. 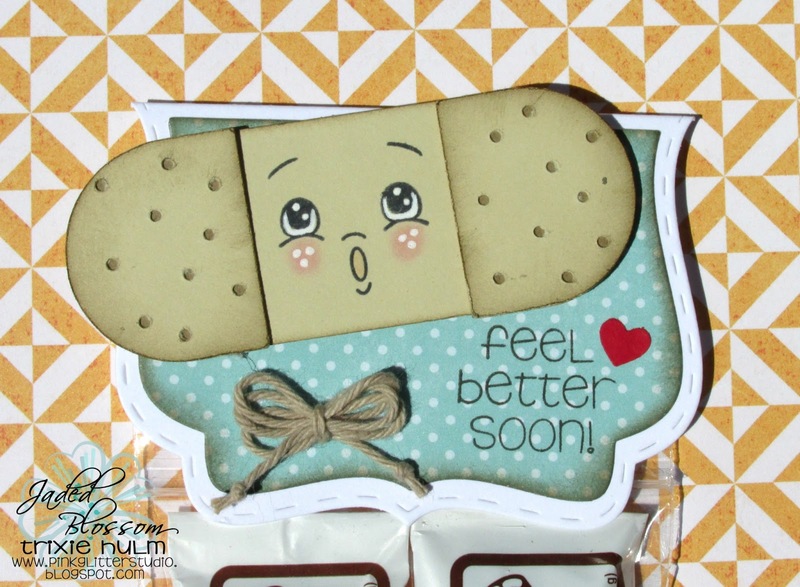 I used the Kawaii Bandaid from SVG Cutting Files and added a Peachy Keen Face from Sweet & Innocent Face Asst. I used Jaded Blossom's 3x4 clear bags for the Chocolate Bandaids, the Fancy Topper Die and the sentiment is from Get Well Soon. I added some Kraft Trendy Twine to the topper. Hello everyone! It's Crystal from Crystal's Creative Corner! I hope you are enjoying your summer! 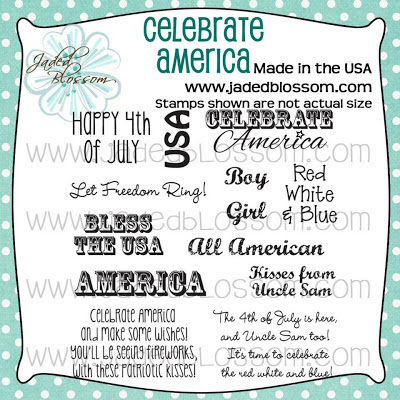 Today is my day to post for the Jaded Blossom Design Team! 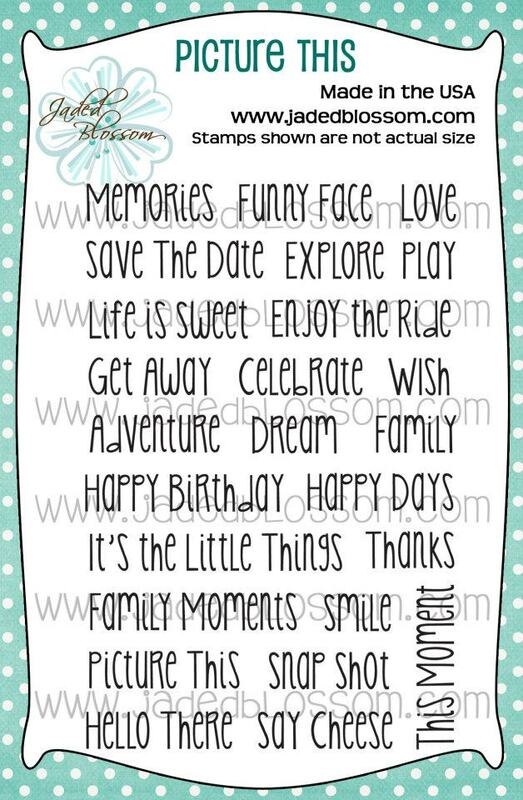 I have created 2 cards for you today! The first one is fun for the summer season! I colored her with Copic Markers and cut her tank top & shorts out of Echo Park A Perfect Summer and All About a Boy 6x6 paper packs. The sun paper is also from A Perfect Summer. the Kawaii Latte Slide Card. 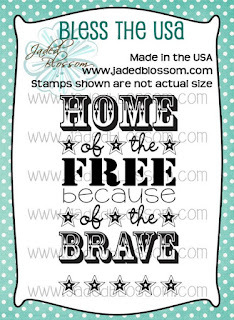 I used Jaded Blossom's Flag Die 2 for the flag, Jave Time for the sentiment and Funny Mail for the lips on the coffee lid and the heart. I hope you have enjoyed my cards today! Thank you for stopping by and Happy Crafting! 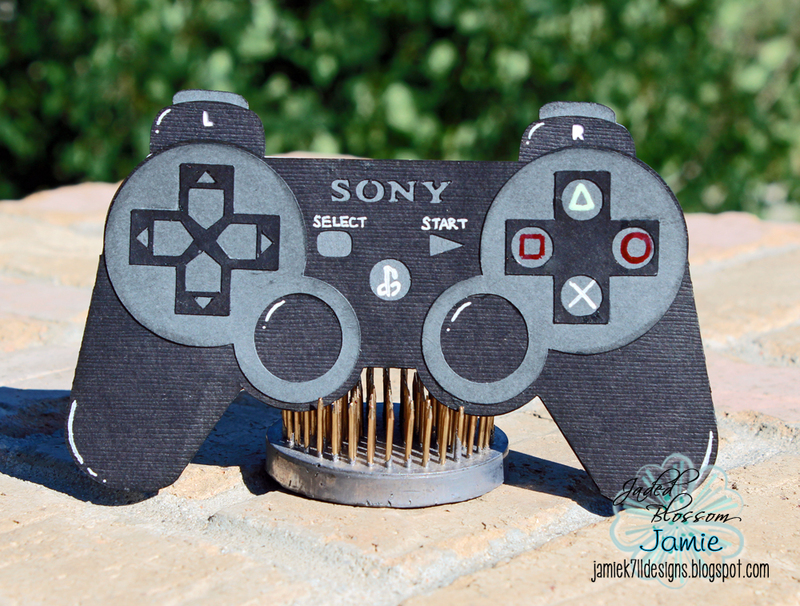 It's Jenny from Crazy About Cricut here! 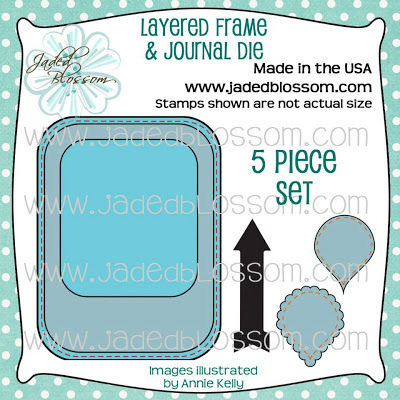 I'm happy to say that it's time for more Jaded Blossom projects today! 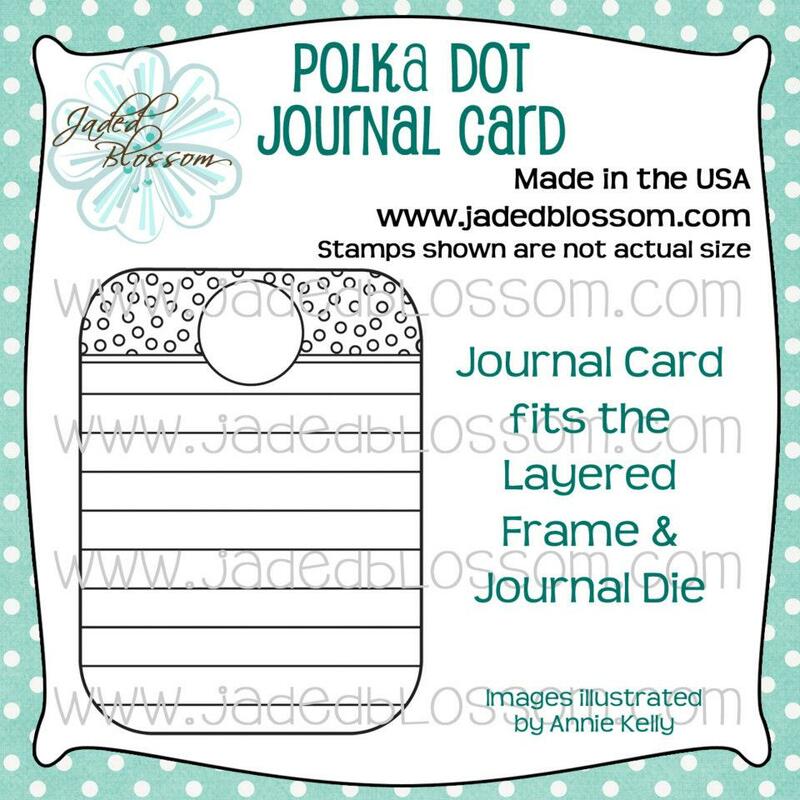 I used the Jaded Blossom sets Calendar Candies, and Journal Calendar to create the perfect card organizer! I also embellished it using the Simple Sayings 2 set, and the Curly Label Die. 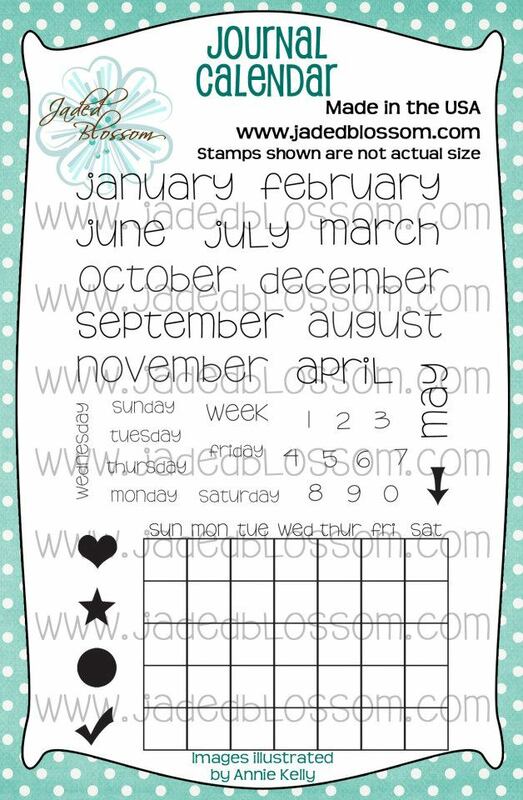 *I stamped the first 6 months on one side, and the other 6 months on the other side. 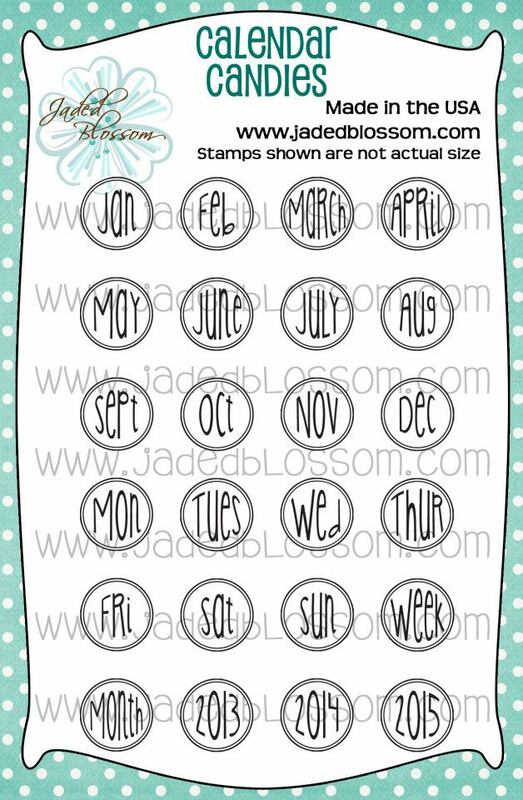 *The Journal Calendar stamp is perfect to be able to mark people's birthday during a certain month, or like the 4th of July like I did here. Before we announce the new batch of Guest Designers, We want to say THANK YOU THANK YOU THANK YOU to EVERYONE who applied. Trust me, it was not an easy choice!! We do encourage EVERYONE to stay active on our blog, facebook page, and participate in blog hops and challenges. We DO notice and that does go into our decision making when picking guest designers. With that said.. are you ready to see the new batch of guest designers?! I know these ladies will do a FABULOUS job and I cant wait to see what they bring during their guest designer months. Please join us in congratulating these ladies!! Hey everyone, hope you're having a great week! This is Jaymie here and I wanted to share a step card I made. 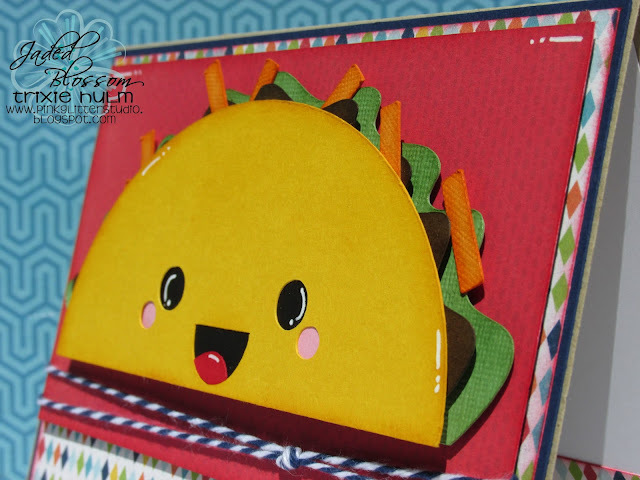 This is my first step card I have ever made and I thought it was a lot of fun! 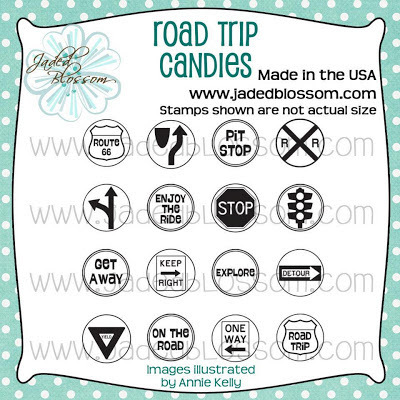 The "Aloha" sentiment is off of the Jaded Blossom Summer Candies set. 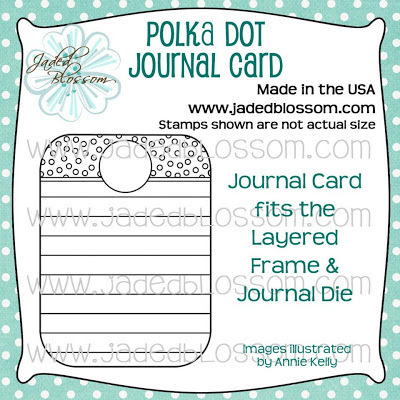 The little scalloped shape is from their Candy Charms and Banners Die set. Isn't this cute little Hawaii scene fun? 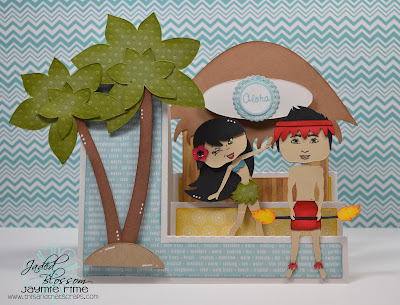 It is from a NEW Luau file that is being released FRIDAY (tomorrow!) by SVG Cutting Files. Here is a close up of the candy charm.. I hope you enjoyed my fun little card today, thanks for stopping by! Jamie here to share the Father's Day card I made for my Husband! 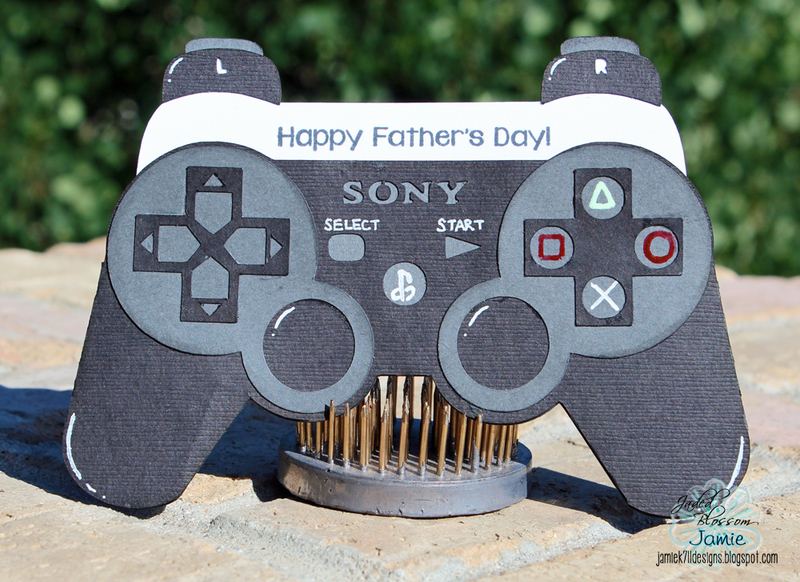 Today I used the Father's Day set but I think the Nerd set would be awesome on this card too! I stamped the sentiment on the insert of the slider card. Here's what the card looks like when it's closed. 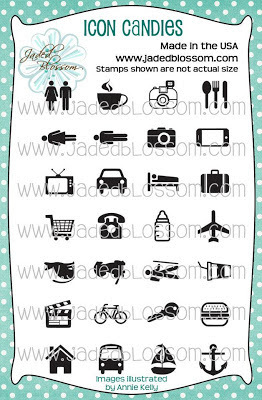 This file is available from SVG Cutting Files. 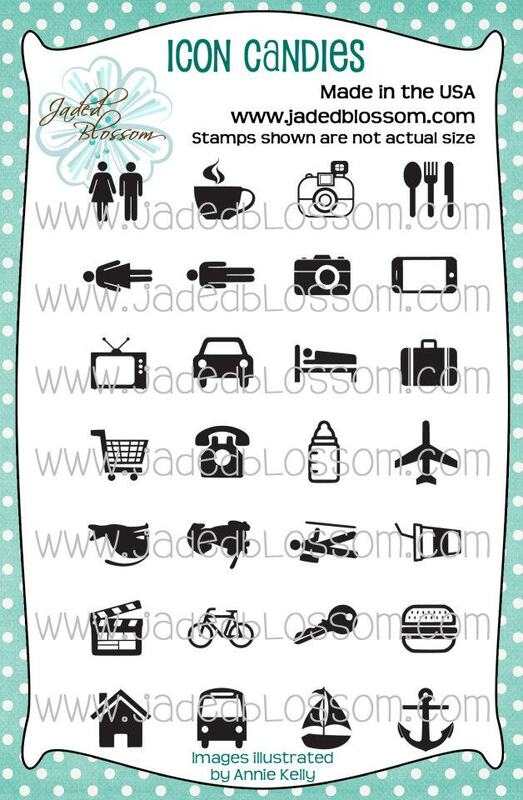 And Some FREEBIE SVG Cutting Files as you Hop Along, that will be available for 24 Hrs Only! So make sure you Hop along and Comment thru all the Blogs for a better Chance of Winning and Getting Em' Freebie Files. *The Super Hero Set had the perfect sentiment!! Celebrate America stamp set, and Flag Dies. Hi Everyone!! Happy Fathers Day! Candace here... Michelle and I REALLY REALLY strive for a crafty atmosphere in which everyone has fun and participates in challenges, blog hops, and over in our Garden of Creativity group on facebook which is why we offer soo many prizes and have monthly guest designers!! Julie from Julies Krafty Korner! We were really excited to see how many people played along with the monthly challenge this month. 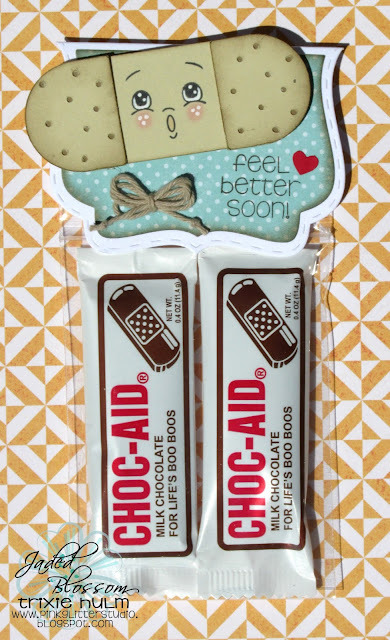 As a special treat, We've decided to give out coupons for 20% off for those who participated in the monthly challenge because all the projects were really fantastic!! For those of you who linked up to this months challenge ONLY, to claim your coupon, please email us at admin@jadedblossom.com. Coupon must be used by July 1st. Deb R from Deb's Paper Palooza! Again thanks to everyone who participated in this months challenge!! Also wanted to show the project my daughter Lily made for her daddy !!! 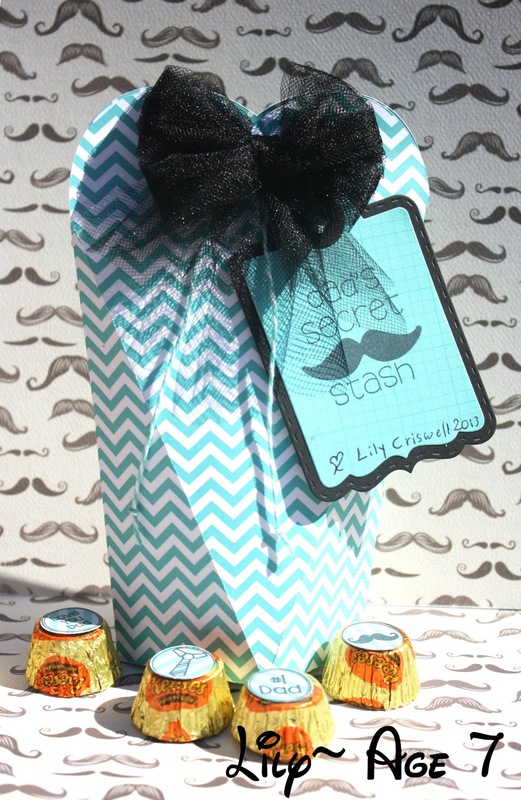 She used the "Fathers Day" stamp set along with the "Secret Stash" stamp set and the Treat Tag die. I helped her with the bow but other than that everything was done by her, she loves to create and I love how easy you can make cute things with our products !!! 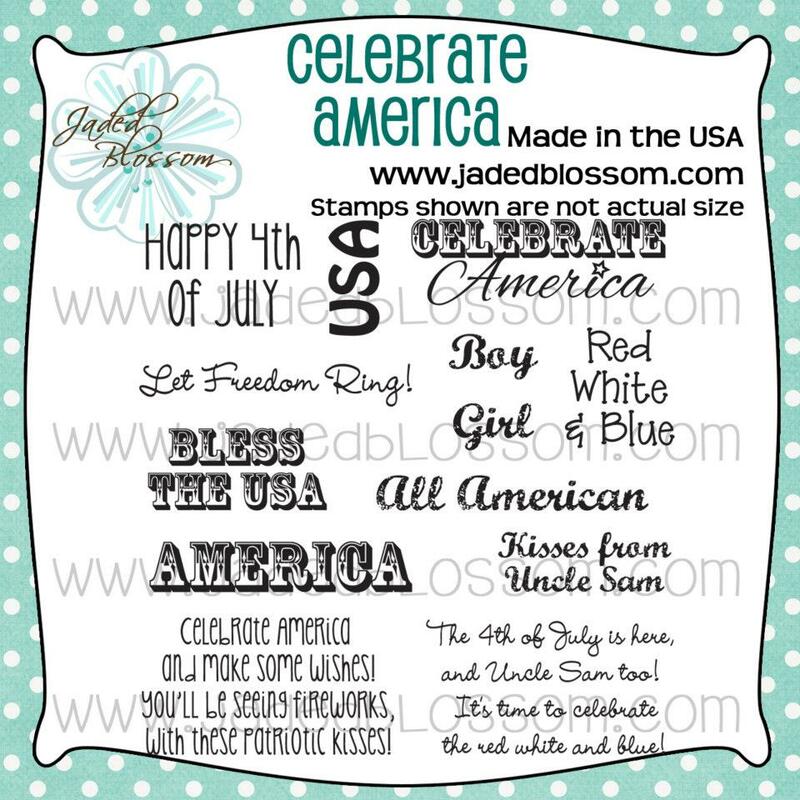 Its time for another post from me as the Guest Designer at Jaded Blossom! I am starting to get sad because I have 3 more posts to go and then I am done my guest DT month :( BUT, I will still be posting in the Garden of Creativity and I will be buying up their stamps! Well, as much as money would allow! LOL! All kidding aside, how about you take a lookie at my project for today??? 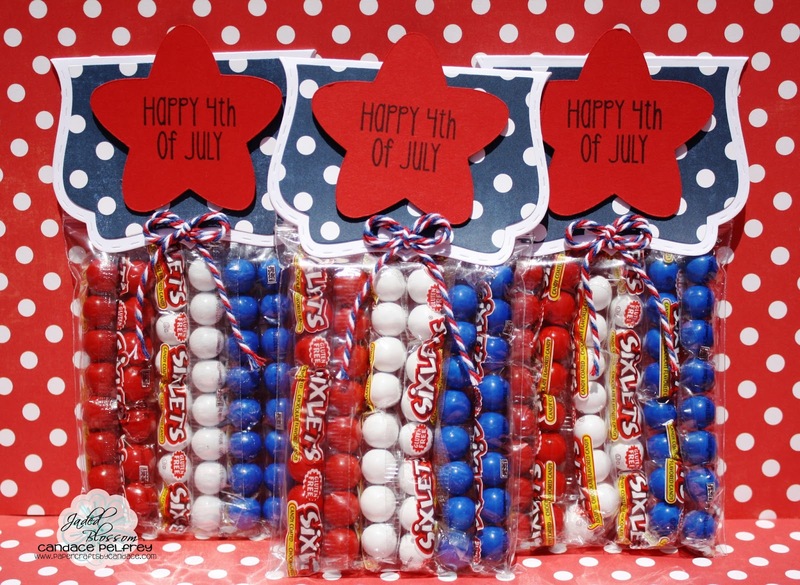 This is a little decoration that I made up for the 4th of July. I found it in the Silhouette Store, and I INSTANTLY had an idea for it! I wanted to put Potpourri inside it, and hang it in my entry way for when people come over for the holiday (I have the BEST view of fireworks..right from my front porch)! I am SURE I could of put little jawbreakers, or M&M's in there, but I wanted the fresh smell instead for this!!! OK all!! I hope you come back to check me out again at the end of this month!! Thanks for joining me for my Guest Designer Day at Jaded Blossom!! So, remember I said I was TOTALLY busy and SWAMPED with projects I was working on for end of school? Well, it was also a project for Jaded Blossom! 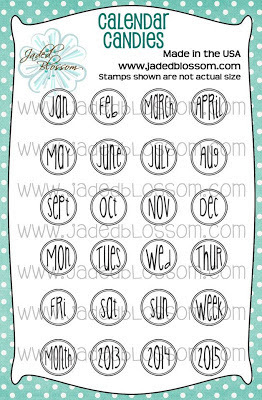 Today and tomorrow I will be showcasing some more of my projects using their new stamps this month (and some oldie but goodie ones)! Well, like everyone else in the crafting world, I have OFFICIALLY jumped on the Vinyl bandwagon! And can I just say, I am LOVING it??? I stocked up on tumblers from Dollar Tree and I rounded up the vinyl I have collected over the years (and even some I was able to get for 50% off at Joanne's...SCORE! So, getting the clear tumblers was not as easy I thought...I went to 8 to get a total of 18 of them! But, I managed to get 18 CLEAR which is what I wanted! I wanted the A+ Teacher to stand out, so that is why I chose white! How super cute is the ABC??? I have been tossing and turning about adding ribbon to the top of it. I have seen a bunch of people do that, but I think it will take away from the treats on the inside!! I hope you enjoyed my project today! Thanks so much for stopping by! 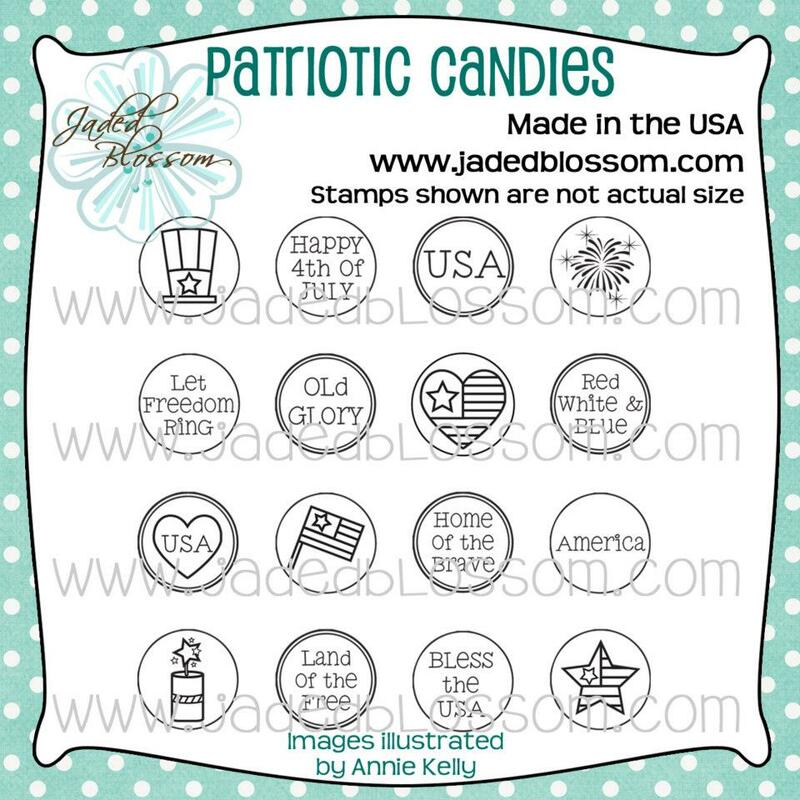 Hope to catch you Craftin' and Stampin'! 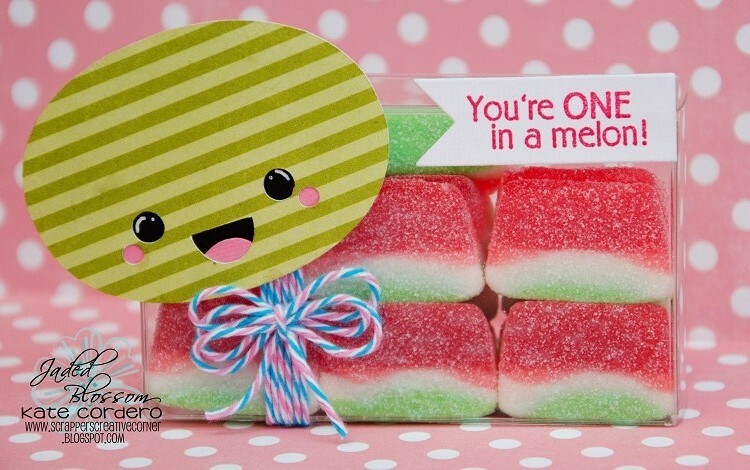 Good Morning, Kate here with you today with a yummy Watermelon Treat. I made this Challenge inspired treat because you have a couple more days to join our June Challenge! BTW, did you know that we are holding a Guest Design Call and it ends on the 22nd, you may wanna check that out. For more details just visit my Blog. 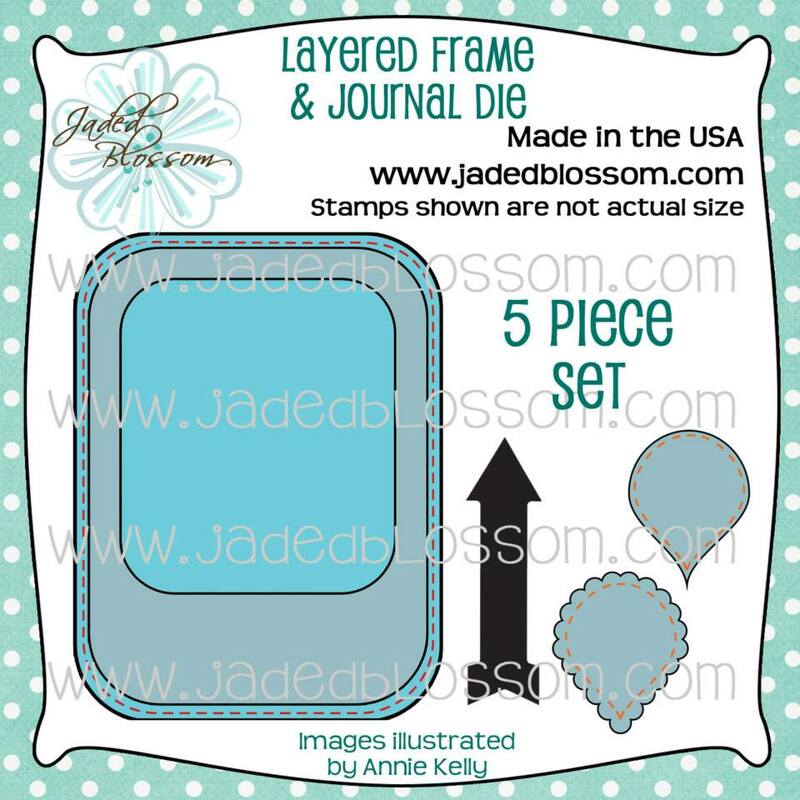 Don't forget to like us Facebook and share your Jaded Blossom Stamps Creation with us in our Garden of Creativity. 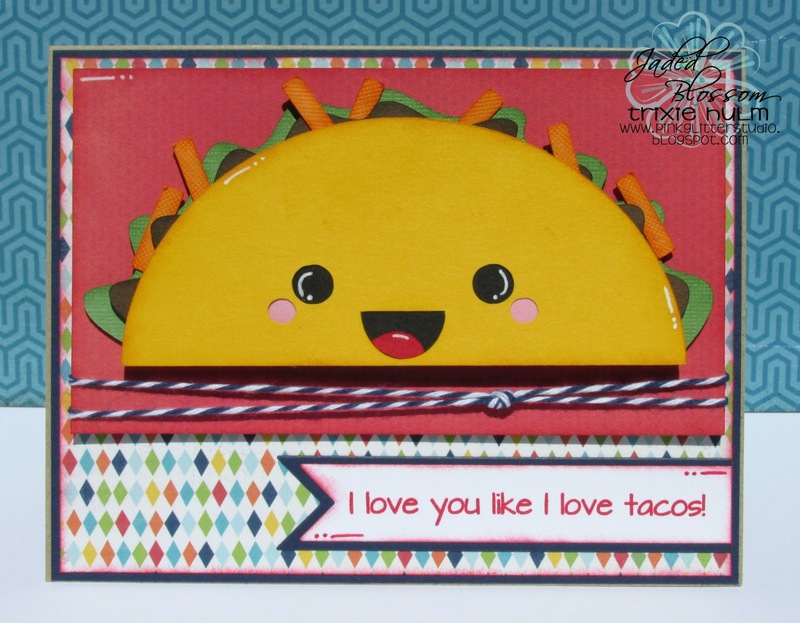 I love you like I love tacos! 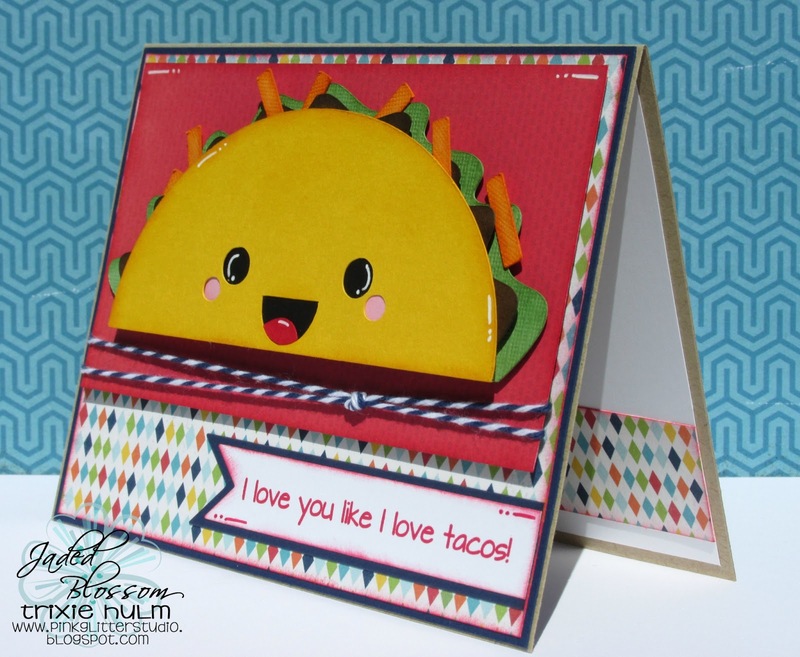 Today I made a card using the Mexican Food stamp set from Jaded Blossom. This adorable little Kawaii Taco is NEW from SVG Cutting Files and is available today. I also used some In The Navy Trendy Twine. and layered it with the small flag die from Flag Dies. The pattern papers I used are from Echo Park "Scoot". Thanks for stopping by to check out my project today! I decided to make a litte something for my dad for Father's Day! ;) He has a sweet tooth and my mom never likes to buy him candy because it doesn't last a day...so I made him his own secret stash! 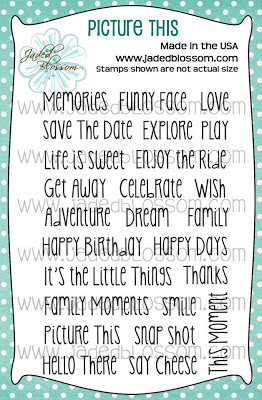 I used the Treat Tag Die and stamped the Happy Father's Day from the Father's Day stamp set, and then used Secret Stash for the rest of the sentiments on the tag. I filled a Starbucks Frappuccino bottle FULL of mini candy bars! I used the candy stamps from Father's Day and used the dies from Candy Charms & Banners for on each of the candy bars. I also covered the lid with Simply Black Rumple Ribbon and then added a bow of Crazy Coral for a touch of color! Did you all enjoy your weekend?! Ashley here from The Glamorous Side Of Scrapping bringing you todays' post! I'm so into clean and simple cards so that's what I decided to share with you all today. You can find more details about my card by clicking here. Don't forget we have our monthly challenge still going on till the end of the week. Click here and you'll be sent right over to the post! We hope you will play along. Thank you for visiting and I hope you all have a fabulous day! It's Finally Time! You are now able to purchase our June 2013 Stamp Release. 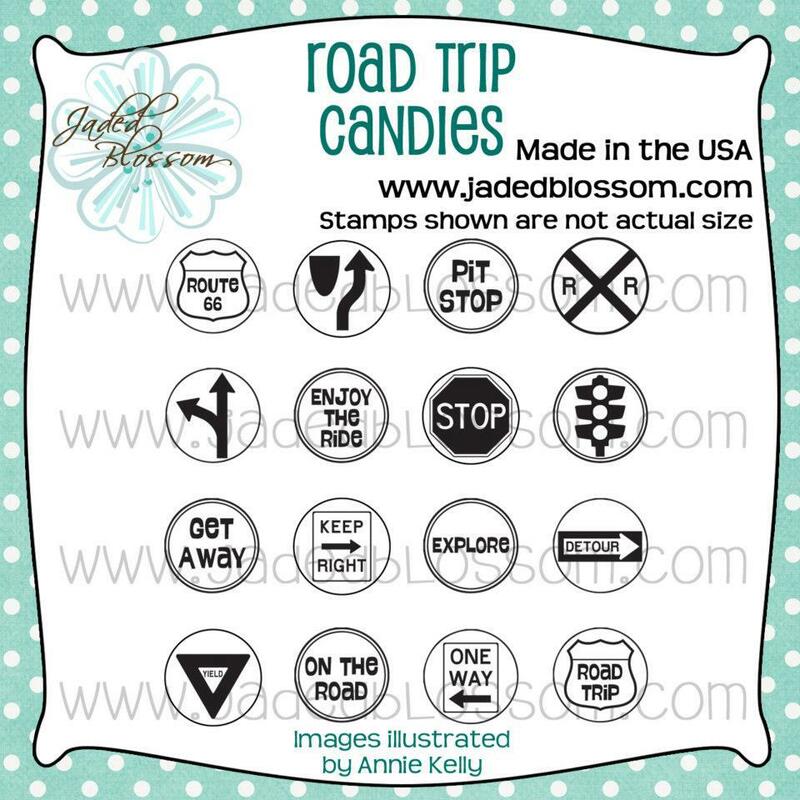 Here is the link to the STORE, but I have also added each link for each Stamp Set and our Bundled Set. I hope you all enjoyed all the Project Inspirations from our Design Team, especially our new additions. 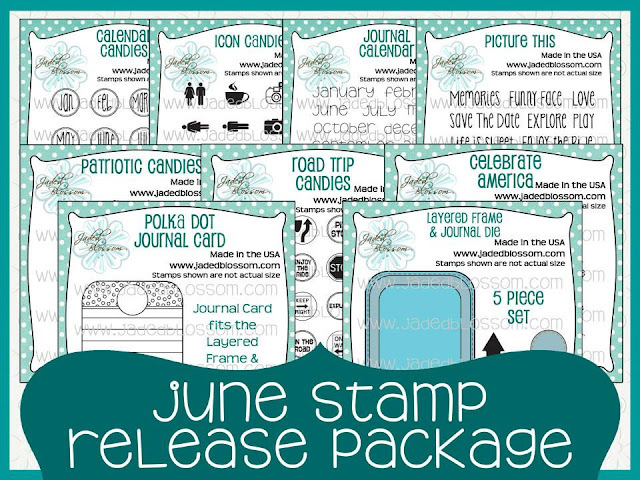 Just in case you have missed our Stamp Release Day's, here is a recap of the Stamp Sets. 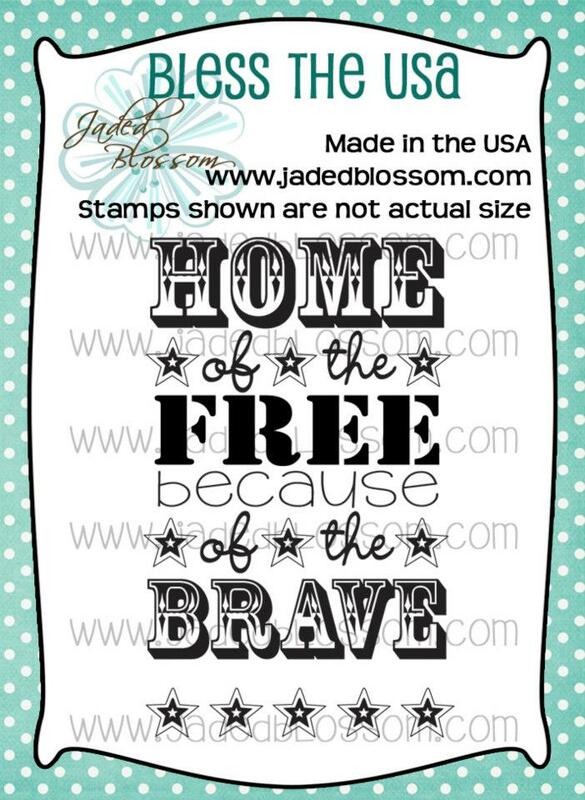 We also have a freebie for customers that spend $40 or more before Taxes and Shipping! Of course, here is what everyone will receive when they order our New Release.